Amber lives in Southern California with her husband, three kids, dog, turtle and fish. 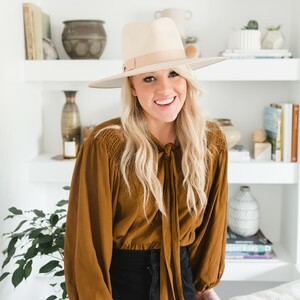 She co-owns a photography and styling company called Dulcet Creative, and loves working alongside brands to bring their products and visions to life through images. She loves to travel, fix up her home, and explore. As parents of three children, my husband and I are continually celebrating “firsts,” from first steps to first camping trips. By witnessing their firsts, it brings back the exhilaration of our own. 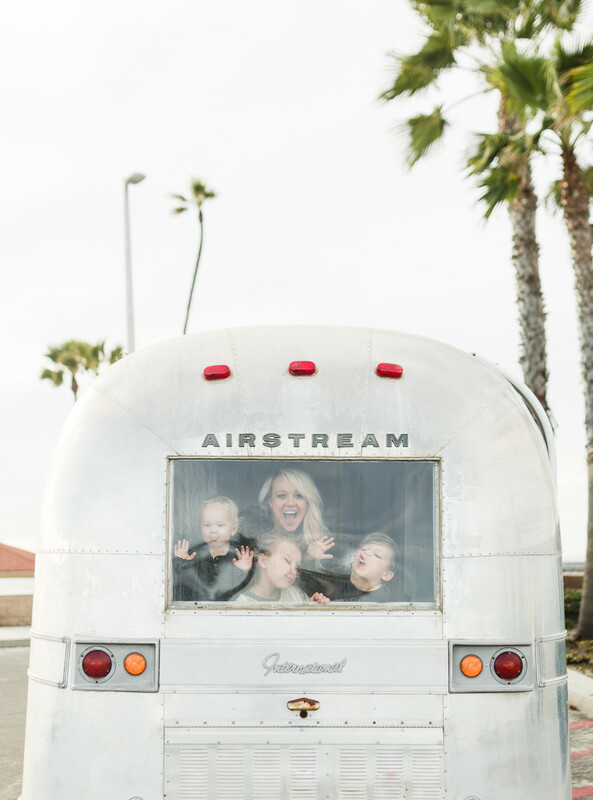 My husband and I remember some of our own childhood firsts while camping with our families: our first roasted marshmallows, our first time pitching a tent and our first night falling asleep to the sound of a crackling campfire—which is why we wanted to give our kids similar memories. 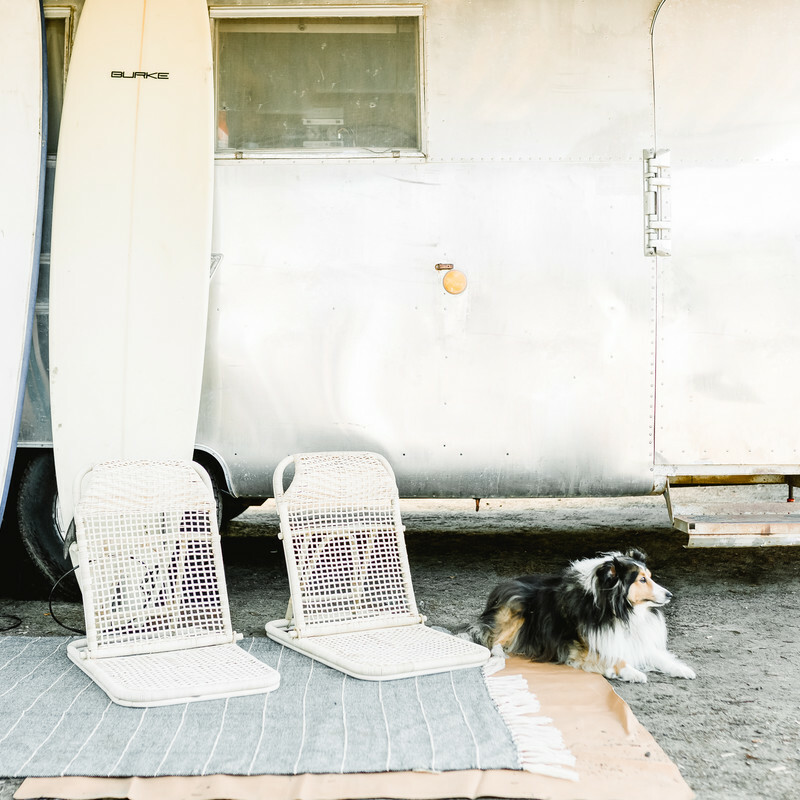 In October, 2018, we saw an ad for a 1968 Airstream Overlander, and we decided to take a look. We had been searching for years for an RV in our price range that wasn’t completely gutted or in need of major repair. Though the trailer was six hours away, the owner had detailed the upkeep and renovations they had done over the years, and we made arrangements to see it in person. With my two-month-old son Crosley strapped to my chest, I opened every cabinet and cupboard, envisioning where all our things could go. The foldaway crib here, kids’ beds there. Although it was old and modest, it felt perfect for us. When we pulled away, we had the trailer of our dreams on the back of our truck, filled with ten years of fantasies that we were about to make come true. The whole drive home, we talked about all the places we would go, the things we would see, and the ways we would make the trailer feel like home. 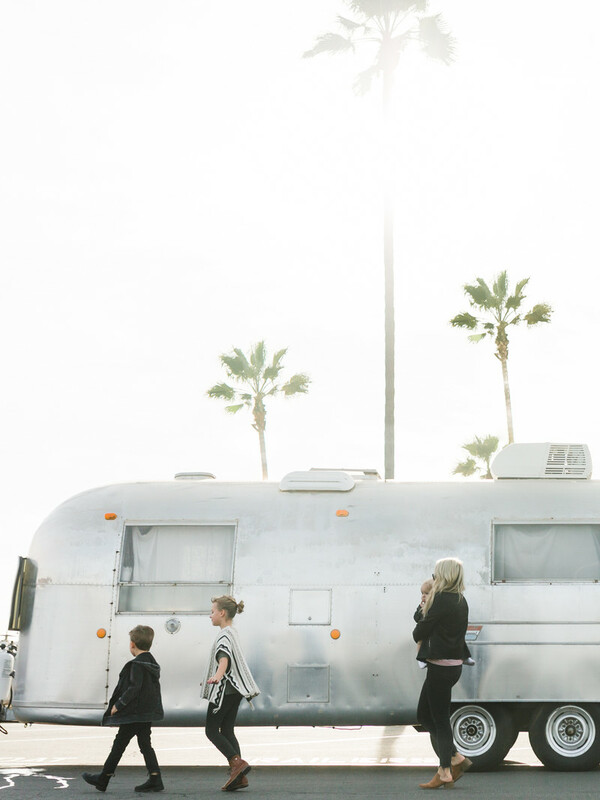 We decided it was to time to plan our first camping trip to one of our favorite state beaches while the weather in southern California was still warm. We agreed that the first trip should be fairly close to home, so we could feel familiar with the area and towing distance. Unsure of what we would need, we planned our check-list of essentials as best we could: pots and pans, cups and plates, portable grill and a generator. We hitched up the trailer and set out on our maiden voyage. It wouldn’t be a maiden voyage without a few hiccups, and as we approached the campground, I realized that I’d forgotten sheets for the beds. One trip to the store later, and we were back on the road again, with fresh sheets, s'mores supplies and a few new toys the kids picked up along the way. The kids were excited to get settled, claim their bunks and unload their new toys into their own closets. As we finally pulled in to the campground and found our camping spot, we knew the first hurdle as new trailer owners was still ahead: backing the trailer into our campsite. 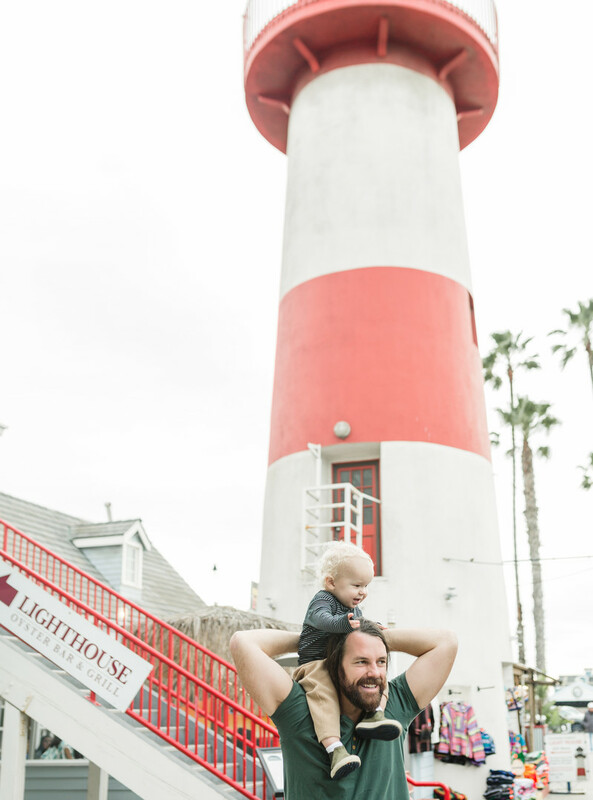 The spots at San Elijo are wide and easy to navigate, but by the time we got to our site, it was dark outside, and our baby had fallen asleep in his car seat. We decided to try quietly backing into the space, deciding that I would use my phone’s flashlight to help illuminate where my husband should go. So there I was, doing my best to shine my flashlight on myself while I made dramatic hand gestures that really were no help at all, and every so often I would have to sprint to his window to whisper instructions; “A little to left!” It was a comedy of errors, but once we got the hang of it, we had the perfect cozy spot along the trees and right up on the ocean’s bluff. 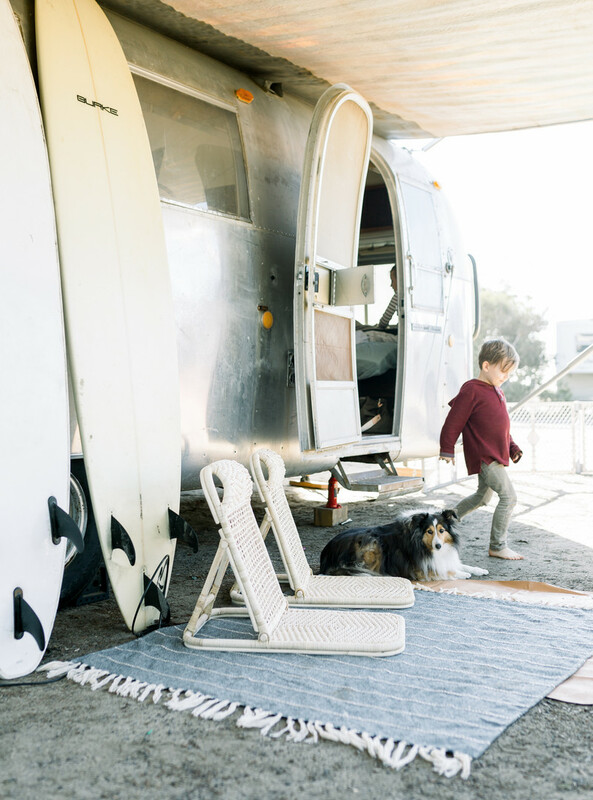 All set up—ready to head to the beach. We leveled out the trailer, opened the cute blue and white sun shade that extends off the side, laid down the rugs, tucked in the new sheets and set up baby Crosley’s crib next to our bed. We had a slight hiccup trying to figure out how to turn on the fridge, but with a little help from the internet, we figured it out after a few tries. (So much for roughing it, right?) I built a roaring campfire and we all huddled around to keep warm. Soon, we would begin the most important mission of the night: to make the perfect s’mores. In between delicious bites of chocolate, gooey, crunchy goodness, we took turns making up outrageous stories, laughing at the occasional marshmallow that would fall into the fire and burn up into an unappetizing crisp. When we ended our night, our bellies were full, hands sufficiently sticky, and hearts full of laughter. As I tucked my babies into their beds, I heard the sound of the ocean crashing and the neighboring campfires popping and crackling. And as my head fell heavy against a cold pillow, I couldn’t help but feel thankful for this new family “first,” in what I know will be a lifetime of many more memories in our RV. A walk along the harbor to watch the seals weave in between the boats. 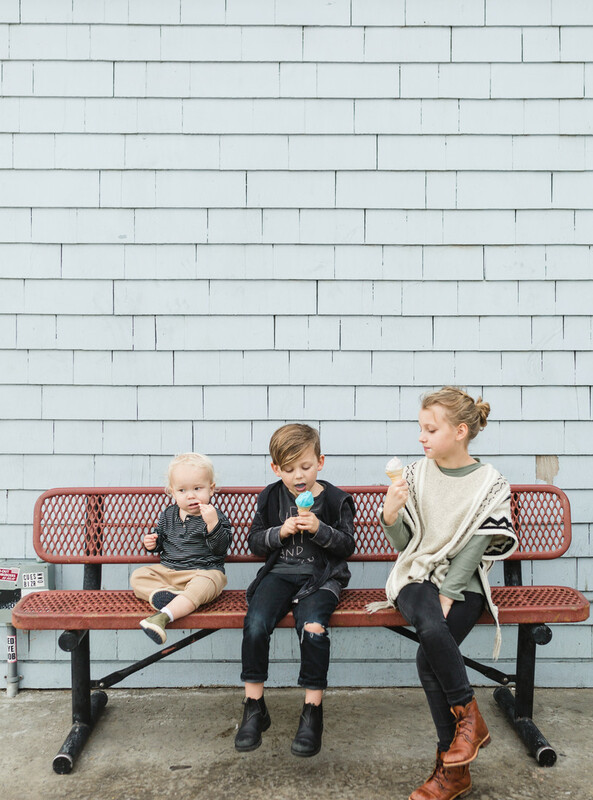 Quick ice cream break before hitting the road. Arrive early enough to set up before dark. Every campsite has a different check-in time, but I recommend arriving as early as your site allows. Give yourself some cushion time to back in, set up and prepare a meal before dark. Keep your food menu simple. Spend some time planning your meals before you leave. I like to choose one-pot meals that are easy to prepare and clean up after, and I prep and chop any ingredients that I can before we leave. Portable gas grills are an easy and fast solution as well. Involve your kids in the packing process. We let each of our kids fill a small bin with toys, art supplies, binoculars, flashlights or whatever they want to bring for the trip. This keeps their toys in one designated place, which is helpful throughout the trip as well. Pack smart. We use storage bins with lids in our RV trips because they allow us to organize things like tablecloths, beach blankets and sand toys, and keep everything from sliding around when we are on the move. They are easy to store in the back of the car or outside of your RV when you don’t need them. Rinse off your feet. If you are fortunate enough to be camping near the beach, bring an extra tub. You can fill it up with water, place it near your front door and rinse off sandy feet before going inside. Although sandy feet are inevitable, this has helped us keep the sand out of our beds at night, and we’ve even used the tub as a last minute bath for the baby, too. Exude positivity. Just like our daily lives at home, things rarely go as planned and that’s part of the adventure. We’ve found that when we do our best to keep an upbeat, can-do attitude, our kids follow our lead.